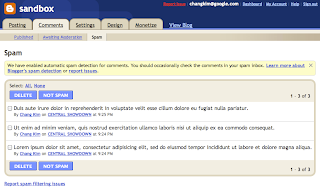 The official Blogger Blog has announced new comments system on blogspot blogs. Blogger has made two new improvements on comments system: Now, you can view your all comments at one place and you can easily filter the spam comments. To prevent get free of spam comment Blogger integrated Google’s spam filtering technologies into the Blogger comment system. To view spam filtering feature, Go to Blogger Draft and the new Comment tab that blogger have recently added. You can see the Spam the sub-tab that show all the spam comment that it suspect to be spam. The comments on the Spam box are not visible to your readers. You can permanently delete Spam suspected comments by selecting then and click Delete button. If you found the comments having to spam, you can select them and click Not Spam button. When you choose not spam comments, that comments will automatically publish on your blog. This amazing new spam detecting feature work as strong spam comment detector. 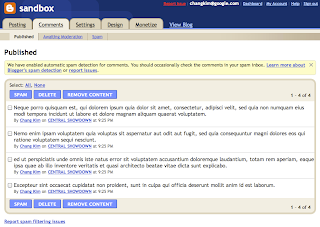 Blogger has created the new comment inbox where you can see all of your blog published comments on one page. The Comments | Published provides a similar views as you email inbox. It is easy to view all new and old comments at any time. In that page you can manage your all of the published comments of your blog. When you select one or more comments and click Spam, it automatically delete selected comments from your blog. You can also Delete comments for editorial reasons or just Remove Content to leave a record of the comment. By doing this, you previous comment record will remain appears on your blog. The Comment Moderation tab also moved in the Comments main tab. Now, it will be very easy to delete spam comments of your blog where blogger automatically detects all spam comment and you can delete it by one click! Also you can view all the existing comments of your blog at one page. Blogger is improving its personality and bringing the new interfaces among us. Blogger post preview before posting, now available! We already like this blogger new comment interface, what about you?